And while administrators often say athletics benefit their universities—and 77 percent of Americans in a Monmouth University poll said they thought big-time programs make “a lot of money for their respective schools”—the NCAA itself reports that only 24 of its 1,200 member schools take in more than they spend on sports. Even after broadcast rights, ticket sales, sponsorships, sports camp and investment income is taken into account, colleges have to subsidize a median 27.5 percent of athletic spending, much of it from student fees, the AAUP says. “The fact is, all the data shows that many of the purported academic benefits of sports—recruitment, prestige—have all proven to not be true. They don’t exist,” Tublitz said. One of the things that I like about UCSC is that sports is a participatory activity, not a spectator activity. A lot more students are involved in intramural sports and in individual fitness activities than bother watching the 250 or so varsity athletes, who the university has been subsidizing at a rate of $1million a year. I’m pleased to see that the national press is noticing that the subsidy of athletics by universities makes no sense, and that UCSC has an opportunity to be a leader in turning their back on this nonsense. I’ve posted on this topic before: I’m proud of UCSC undergrads, Sports at Any Cost, and Not so proud of UCSC undergrads this year. I am hopeful that students will realize that subsidizing a couple hundred of their fellow students to play for them is not nearly as valuable as playing themselves—that they are better off taxing themselves for equipment and facilities that all students can use than for special services (coaches, trainers, transportation) for just a few. I also hope that the UCSC administration comes to its senses and realizes that students are having a hard time getting into the classes they need, because of all the growth in student enrollment without a corresponding growth in instructional resources, and that the $1million dollars a year they pour down the athletic drain could be used to provide more classes. That $1million would pay for about 100 more courses taught by lecturers, or 40–50 more taught by tenure-track faculty, about 40 more TA sections. (Surprisingly, TAs cost departments much more than lecturers, because departments have to pay the tuition for TAs, which get recycled back into other things—like subsidizing athletics, probably.) The money would benefit about 3000 students a year, rather than the under 300 who benefit from athletics subsidy. I think that it is past time for UCSC to leave NCAA sports and return to having just club sports, as they did when I first started teaching at UCSC 30 years ago. PZ Myers has a nice discussion of the convergent evolution of the synthesis of caffeine (separately evolved at least 5 times! ), based on the paper from PNAS, Convergent evolution of caffeine in plants by co-option of exapted ancestral enzymes, by Huang, O’Donnell, Barboline, and Barkman. Biologists used to think that there was one canonical pathway for caffeine synthesis, from xanthosine through 7-methylxanthine and theobromine to caffeine. The paper shows that some plants use a different pathway (through 3-methylxanthine and theophylline) and that the enzymes used even on the common pathways are different. The evolutionary model that best explains the data is that ancestral enzymes were promiscuous (which means that they had several different functions, not that they were sexual) and were eventually duplicated and specialized for caffeine production. The researchers reconstructed some of the ancestral enzymes from the modern descendants and confirmed that this hypothesis was reasonable, as only single amino-acid substitutions were necessary to confer the two different specificities of the modern enzymes from the ancestral ones. I just found out about a cool game, but one that few people can play: Threadsteading. 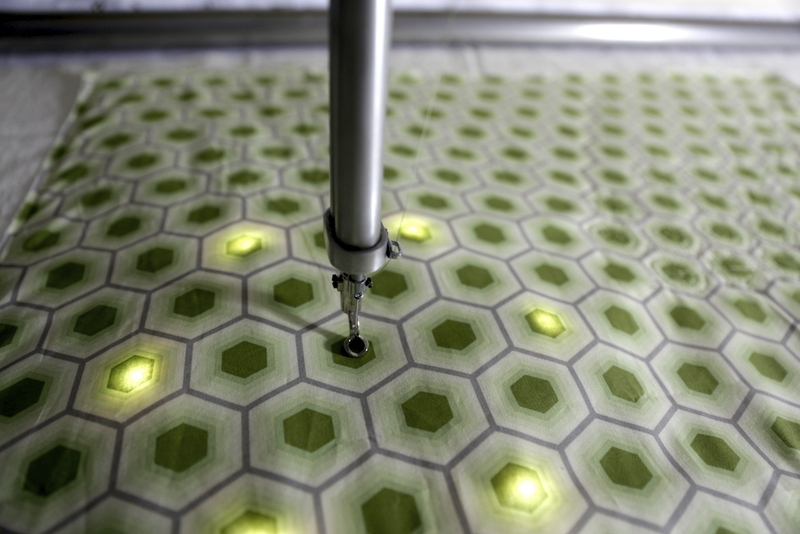 Threadsteading is a two-player game for a modified quilting machine. The quilting machine is a computer-controlled longarm quilting machine, which moves a sewing head around a 12′ x 2.5′ area to stitch 2D paths. Our custom input controller is attached to the sewing head, so it is always located just under the fabric surrounding the needle’s position. We’ve also reverse-engineered the control to the machine so we can send sewing paths directly to it. The game is thus played entirely on the quilting machine, and each round of the game results in a permanent physical artifact: a quilt. They also have a version of the game that can be played on a smaller scale on a computer-controlled embroidery machine, which is something that is more likely to be found in a home. I found out about the game because two of the designers are affiliated with UCSC (April Grow is a grad student who was a Disney Research intern, and Gillian Smith is a UCSC alumna), so the game was mentioned in a recent press release by Tim Stephens about student-designed games in the UCSC game-design program: UC Santa Cruz student games featured at IndieCade Festival. Some of the other games mentioned in that press release also sound interesting, but none are quite as out-of-the-norm as a game on a quilting machine.